Previous editions of this book have helped well over 100,000 students and professionals write effective proposals for dissertations and grants. Covering all aspects of the proposal process, from the most basic questions about form and style to the task of seeking funding, Locke/Spirduso/Silverman’sProposals That Workoffers clear advice backed up with excellent examples. In the fifth edition, the authors have included a discussion of the effects of new technologies and the Internet on the proposal process, with URLs listed where appropriate. In addition, there are new sections covering alternative forms of proposals and dissertations and the role of academic rigor in research. As always, the authors have included a number of specimen proposals, two that are completely new to this edition, to help shed light on the important issues surrounding the writing of proposals. 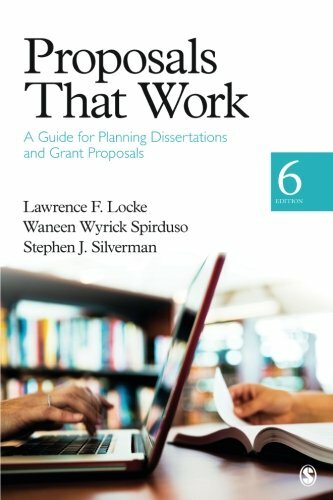 Clear, straightforward, and reader friendly, Proposals That Workis a must own for anyone considering writing a proposal for a thesis, a dissertation, or a grant.